Limited Liability Partnership or LLP is a business structure which is formed by a legal LLP agreement. This LLP agreement holds information about how your business will run such as who will become the designated partner or assigned roles of various partners. However, it is necessary to have at least two designated partners who will assume responsibility for the partnership’s actions. At least one of these two partners should be an Indian resident. If all the partners are body corporates, then nominees should be appointed to work as designated partners. Further, it is also required that the name of the company contains ‘Limited Liability Partnership’. LLP is always said to be a mixture of a partnership and a corporation. While it is a lot similar to both, LLP separates personal owner assets from other partners’ faults, employees’ wrongdoings, or LLP as a whole. Limited Liability Partnership is often termed as a hybrid business structure that incorporates the best features of a partnership and a corporation. It is a distinct entity and the partners of an LLP file their losses and profits in their personal tax returns. But, it makes the partners responsible for only the debts and liabilities arising from personal wrongdoings. In LLP, personal assets of partners can’t be taken or seized to clear partnership liabilities and debts. It is a separate legal identity and every partner has only limited liability, which means claims can only be made against the business or LLP and partners are responsible for their partnership contribution. As an LLP is a separate entity, contracts of the business can have LLP’s name on it and don’t require every single partner to sign the documents before they are passed. In an LLP, the entire company doesn’t dissolve on demise, bankruptcy, or resignation of one or more partners of the organization. LLP does not mandate a certain minimum contribution. It can be easily registered with least capital available. In fact, any partner’s contribution can be in form of tangible, intangible, movable, immovable, or other benefits. 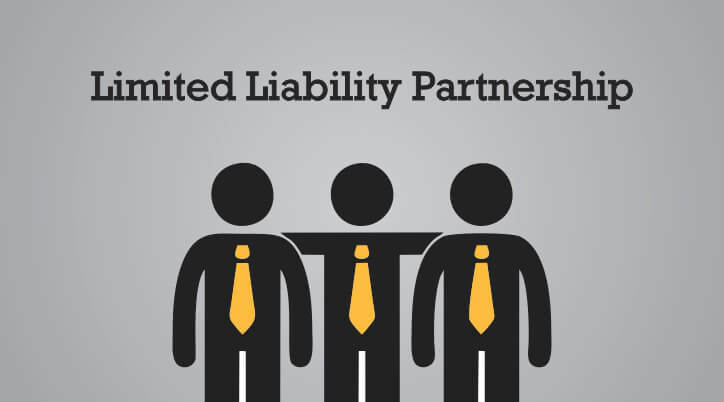 Just as a corporation, LLP also doesn’t have a limit on the number of partners. There can be any number of partners. In an LLP, partners’ responsibilities are flexible. They decide their managerial roles themselves in the agreement, and every partner holds their personal right to manage the business. LLP follows principles of pass-through taxation, which means that the organization avoids the burden of double taxation, payment of dividend distribution tax (DDT) is not applicable, and all the partners are liable to pay only their personal taxes. Moreover, audit is necessary only when the annual accounts cross INR 25 Lakhs or the turnover crosses INR 40 Lakhs. If the tax return is not filed for an LLP even when the business has practically no activity, the non-compliance can lead to a very high penalty. Just like partnership firms, a single person can’t form an LLP. It needs at least two people to form an LLP. LLP is not classified by shares, which makes it less possible to offer shares to receive funding in return. An LLP is not allowed external commercial borrowings (ECB), which means that the organization can’t acquire commercial loans from foreign banks, foreign financial institutions, or foreign partners. PAN card, address proof, residence proof, photograph, and passport (For all the foreign members of the LLP). Proof or utility bill of registered office, a copy of the rental agreement signed between the landlord and you, and no-objection certificate acquired from the landlord. To collect all the necessary documents, download Types of Business Entity Formation Checklist by deAsra. You just have to click on View, enter the account details or sign up using Facebook or Google, and download the pdf. Using this pdf as a reference, collect all the necessary documents for starting your own business. If you have even a single doubt in the formation of the agreement, it is advised to call an attorney. Even one mistake can lead to unnecessary delay in the approval process of the formation or, in worst case scenario, subject some or all partners to unlimited personal liability. The main reason for LLP’s popularity is its simple structure with fewer formalities and flexibility that don’t hold partners accountable for debts and liabilities of other partners. Many small organizations have started choosing this business structure because it has a lot to offer and it doesn’t come with the hassles of a corporation or a partnership. However, if all the partners in an LLP are Body Corporates then they should appoint nominees who shall serve as designated partners. Name of LLP: The name of LLP should end with the words “Limited Liability Partnership”.